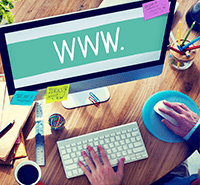 Wix​ is one of the most popular DIY website builders for good reason. It’s extremely affordable, remarkably easy to use, and almost endlessly customizable. Anyone can choose their website’s layout, colors, image sizes, and other factors with just a few simple clicks. The customization aspect is possible largely because of the Wix App Market. 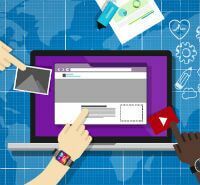 Think of it like the app store on a smartphone, except instead of flying bird games and productivity tools, it’s filled with applications specifically for websites. The Wix App Market contains about 250 apps that span every conceivable need from marketing to social media to fancy image integration. Users can create fun quizzes, set up a shopping cart, or even change the layout of a website. The apps are easily searchable, and users can browse user reviews and star ratings to get a feel for which apps actually provide value. Some of the apps, like Blogger and AdSense, are completely free to download and use. Others, like Wix Music, are available for a small, one-time fee. Some of the more advanced apps require a monthly fee. For example, Tidio Live Chat costs $10 per month but allows users to improve sales by chatting in real time with all website visitors. Many apps have both free and premium versions available. For example, Eventbrite allows users to post upcoming events complete with links and calendar reminders. The free version allows up to three events to be posted at a time while the premium version ($3.99 /mo.) allows for unlimited events. The Wix App Market is remarkably simple to navigate. After registering with a free or premium Wix account, a user needs only to click the “Manage Site” button to access the website builder. 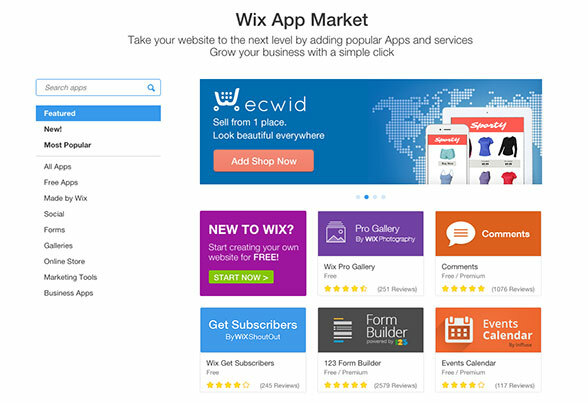 The “Wix App Market” button then appears in the left column. The icon for the Wix App Market looks like a basic marketplace tent. Once the icon is clicked, it reveals a pop-up window with the Wix App Market home page. From there, the user can browse the featured apps, filter apps by category, or use the “Search” bar to locate specific types of applications. By clicking on an app, the user can read reviews, watch demo videos, browse features, or learn about pricing. Downloading the app is as simple as clicking the “Add App” button. Downloaded apps are automatically saved in the “My Apps” folder. To access this folder, the user can click the “Site” button and select “My Dashboard.” The Apps folder can then be found on the right side of the screen. Individual apps can be accessed by clicking the “Open App” button that appears to the right of the app description. Some apps also feature an “Upgrade” button. This button appears beside free apps when a paid upgrade is available. After an app is opened, a list of settings appears. Here the user can dictate exactly how the app looks and functions on the site. For example, the Instagram app contains a series of fields that allows the user to choose the layout of their image galleries. Galleries can be placed in the footer or more prominently on webpages, and they can be arranged horizontally or in other configurations. The user can also choose specific images or select the number of images that will appear on a page. Having more than 250 apps available for purchase and installation on your site is an amazing feature of Wix, but you’re going to need to know how to set them up before you can enjoy the ride. On the left side you’ll see a list of categories, which you can select in order to filter the app results. You can also just use the search bar if you prefer. Once you’re presented with the available apps you can take your time to read up and learn about them. On the Wix app market the apps are displayed one by one in easy-to-read blocks that include the name of the app and a short, two line description. In addition, each block also shows the costs, the rating (and how many votes it was based on), and the number of downloads. If you’re still unsure, you can click on the app for more info, which will take you to a screen that includes an overview, demo, features list, reviews, and developer info. If you’ve found an app you want to install on your site, scroll over it and click “add to site” and then click “add app”. Now, with great apps comes great responsibility. Use wisely. 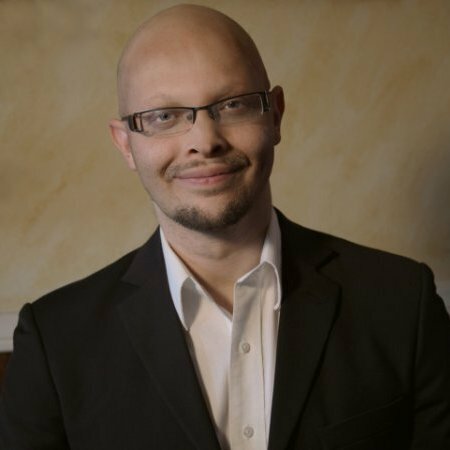 You’ve downloaded an app, now what? Pro Gallery – This free app enables users to set up gorgeous photo galleries complete with video and text box integration. Users can even adjust the sharpness and overall look of each photo. Instagram – The official Instagram app for Wix allows users to place an Instagram feed on their sites. The layout is customizable, and the app is completely free to use. Comments – This app enables users to add a Comments field to any page. The app also allows for customer/user reviews. The free version only supports a maximum of 10 comments while the paid version ($4.00) supports unlimited comments. 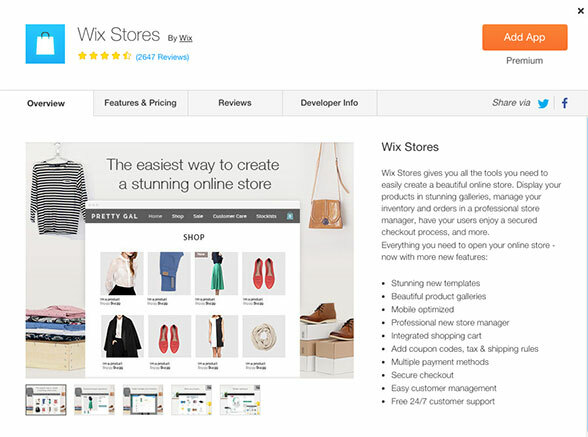 Wix Stores - This is the simplest way to turn a Wix website into a fully functional Ecommerce store complete with secure checkout, 24/7 support, coupon codes, and product galleries. The pricing is tailored to the needs of each store. Wix Bookings – With Wix Bookings, visitors can schedule appointments using simple forms. It supports calendar integration and helpful reminders. Free and premium versions are both available. Wix Hit Counter – This one is pretty straightforward. The hit counter appears at the bottom of the page and keeps a running tally of all visitors. Best of all, it’s free and easy to use. Form Builder – Create order forms, quizzes, polls, contact forms, and much more. The free version allows users to create up to five forms and receive 100 submissions each month while the premium version ($3.99) allows for up to eight forms and 1,000 submissions each month. Google AdSense – This free app makes it easy to place Google ads on any page. It supports all common ad sizes, including 468x60 banners and 125x125 buttons. Site Search – This enhanced search box allows users to easily find text, images, and products. The search box is free to use, but the premium version ($4.99) includes enhanced features like AutoComplete suggestions and search filters. The Wix App Market makes it possible for even the least tech-savvy webmaster to bring their precise vision to life. The apps are easy to find, easy to install, and fun to customize. To start exploring the Wix App Market, register for a Wix account today.